This is a beautiful example of a sculpted boulder. The stone has been shaped into a Turtle. The head is exposed to on the lower left. The plates of the shell are clearly defined and the left front leg lays alongside as if the Turtle is swimming by. All of my discoveries have been located on this one hill or its lower levels. This hill is in geographical alignment with America’s Stonehenge and the North Salem Balanced Rock. This alignment represents the Major Lunar Standstill. Other sites aligned with this event include Chimney Rock in Colorado and Hopewell Sites in Ohio. This hill is made of solid stone and quartz. All sides of the hill have exposed ledge and large megaliths are positioned in hundreds of places. It is my opinion that this hill was a central meeting spot . I believe that is was used for a number of things such as a calendar , celebrations, memorials (headstones) and a quarry for megalithic stones. The amount of quartz in the stone makes it unique . It was said that the adjacent property crushed thousands of tons of pure white quartz when they were blasting for construction. The energy coming from or being held within the quartz may have been an additional reason for choosing this site. This is the view looking Northwest towards North Hampton, MA. In the second picture you can see the Holyoke Range. Views looking Southwest revel the tall buildings in Springfield and planes taking off from Bradley International in Hartford, CT. Looking east at night or a clear day will allow you to see the sparkling lights of Worcester. Only from a few places on a clear day with no leaves on the trees can you see Mt. Monadnock in the north. One hill prevents any view of Wachusett Mountain but both sites are on the same Lunar alignment. We have recently discovered for ourselves a well known rock formation. Its known for the large stone balancing on the top. What is clear to me is the distinct features of a large mountain cat. In the coming weeks we will have artist renditions of the Animals in Stone. “Mount Wachusett is located in the towns of Princeton and Westminster in Worcester County, Massachusetts. 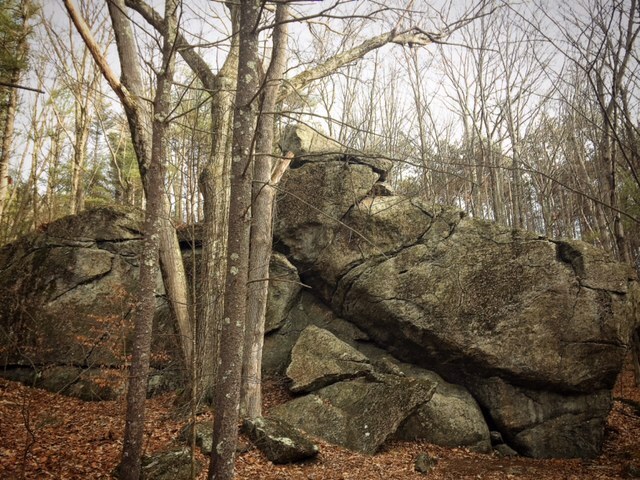 It is the highest point in Massachusetts east of the Connecticut River. The mountain is named after a Native American term meaning “near the mountain” or “mountain place”. 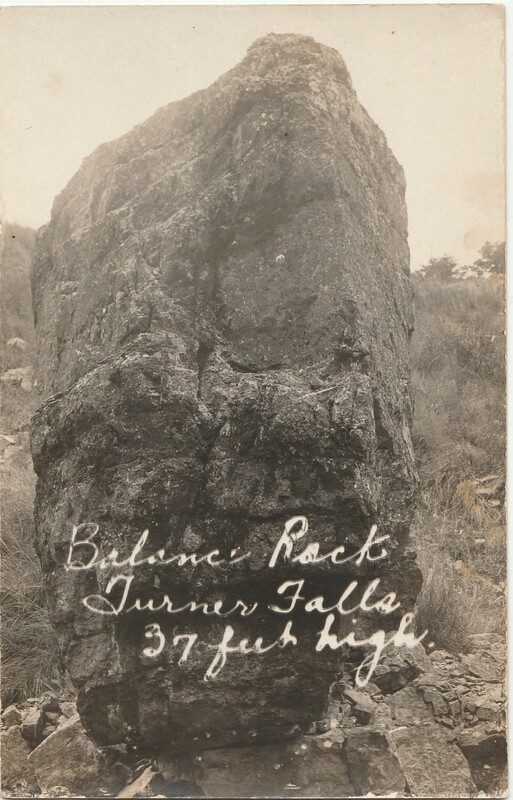 I recently acquired this photo of a stone called “Balance Rock” in Turner Falls. The problem is knowing if it is Turner Falls , OK or Turners Falls, MA. The stone is being noted as 37′ tall. You can see the base of the stone has been positioned or propped. 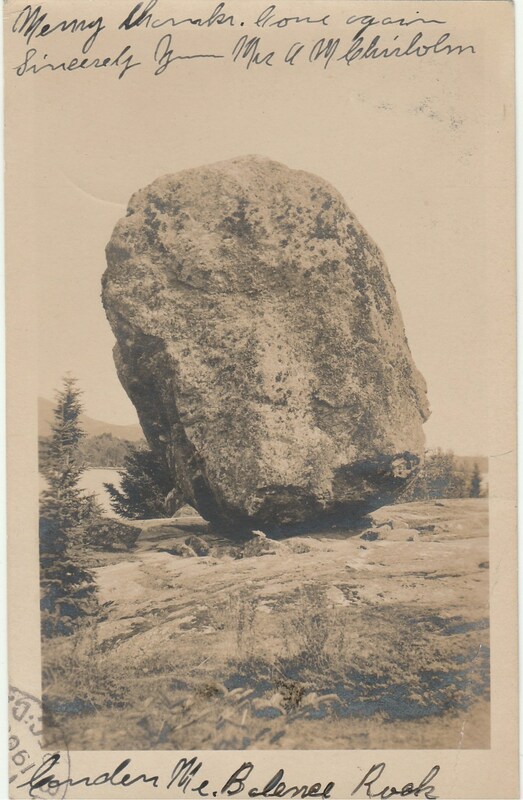 What are your thoughts on this boulder? Do you know where it is?